As my mom says, we're going back in time again. Goodbye plastic wrap. Hello cloth covers, 'aka Bowl Bonnets'. 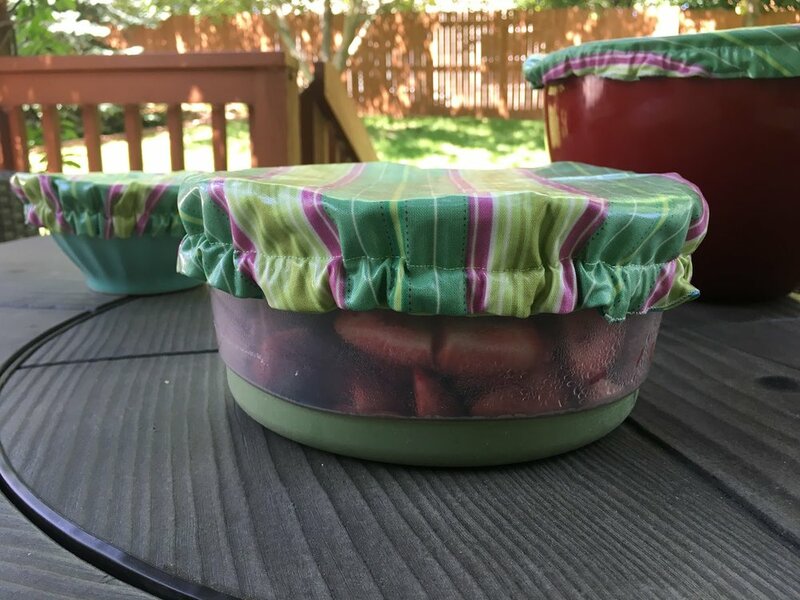 Bowl Bonnets was a product that was used a couple of generations ago, before plastic wrap. Was plastic wrap invented because of the ease of it? I don't know, but I certainly think these stretchy laminated cotton covers are way better - healthier, convenient, and definitely more green. Why isn't plastic wrap? Polyvinylidene chloride, or PDVC, is the polymer in plastic wrap that makes it stick to itself so well. Researchers have discovered that trace chemicals found in plastic products are responsible for an assortment of medical conditions. When they are burned, like they often are when trash is incinerated or when people use it in the microwave, they can release toxic chemicals into the environment. Because of this big companies (still beware of generic brands) like Saran Wrap got a conscious and removed the PDVS and that is why you find they don't stick well anymore. Have a set of glass dishes that don't have lids to store leftovers? How about something over your baked goods after they cool? 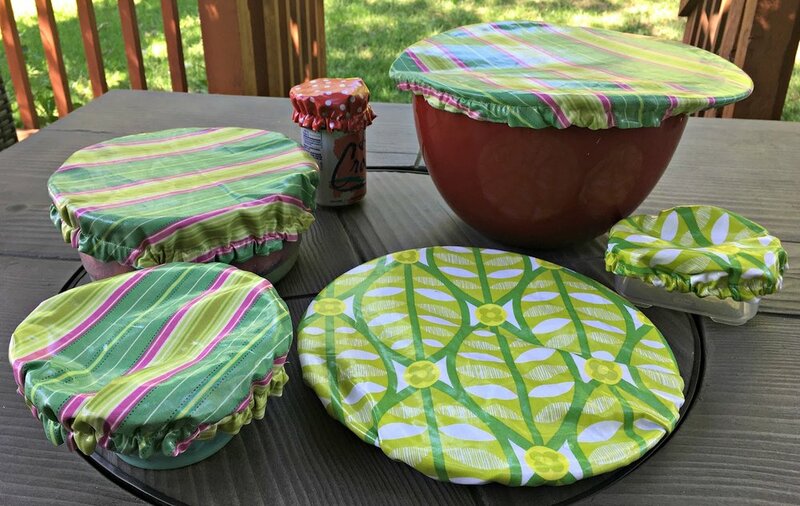 Maybe you need to cover you mixing bowls while your dough sets. Or have a plate waiting with dinner on it for your spouse on their way home from work. Grab your Bowl Bonnet out of the drawer and cover it. The elastic gives it a snug fit. Doesn't even have to be the standard circle as they accommodate many shapes from oval to square and rectangle. 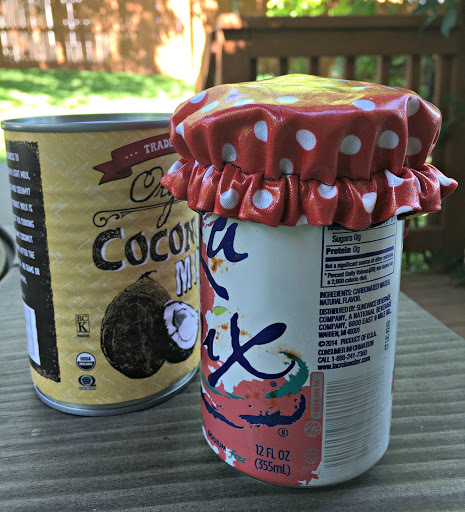 The small size (coming soon to Green City Living) is perfect to cover a soda can when you only drink a part and don't want it to fizz out. Or an aluminum can when you don't use all the contents. My favorite use is to cover up an avocado, lemon, or orange when I've only used half. Reuse over and over. No waste. How would you use your Bowl Bonnets?